Obviously a sketch, I know it is a little rough but give me a break as it is my first attempt at drawing one. Anyway you get the idea. You can flip it, rotate it what ever you like as long as it is still recognizable as the sketch. I have put my example below for you to get an idea of what I mean. 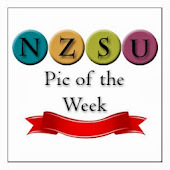 Just leave a comment linking back to your entry on your blog so everyone can check it out. This is Kim's toatally fab Christmas card, I love that star. I just thought I would give you all a subtle reminder that the Jolly Fat man will be visiting sooner than you think. So get to with those xmas workshop plans. You can check out more of Kims lovely cards on her blog "Inkin Fun"
Isn't this card just stunning!? Anne Marie's been experimenting with water colouring using watercolour paper. If you love water colouring give this paper a go, it costs a little more but makes such a difference to your card. Check out the differences on Anne Maree's blog including more details on her card by clicking HERE. I wasn't planning to post again today, especially as while I'm typing I have a stinky 2 year old climbing all over me. But I came across Sharlene's card while I was checking out what you all have been up to. I love how she's used the ballet blue and layered her stamp sets. 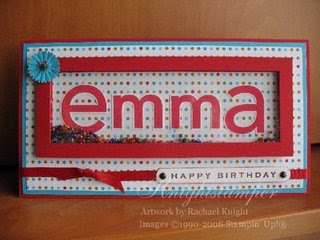 Check out the details of her card by visiting her blog Magpie Creates. I wanted to share another tin with you. This by Lisa who is fairly new to blogging but seems to have caught on well. I love the scalloping she's used on this one. 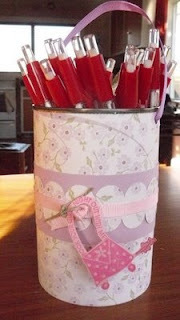 Visit her blog Stampin' Up! With Lisa. 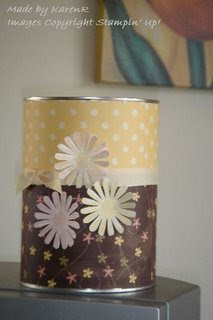 Tins are always a great thing to alter. I've got an altered money tin that I did for Baylee, it'll be a shame when we eventually have to cut it open so she can bank the money she's collected in there. Anyway here's a very cool tin that Karen altered. She's used Spring Showers and Spring Flowers. Both sets of DSP are still available but aren't published in the current catalogue. Check out Karen's tin in more detail here. Here is my card for Trudi's embossing challenge, it is a basic resist technique card that I made to do in Stamp Club last night. Lot's of stuff ups that I tried my best to disguise. Since it's only a few weeks until Father's Day I thought I'd keep an eye out for cards for guys. And today I came across this one made by Sharlene, although it's not intended for Father's Day it's still a fantastic card and I'm sure Sharlene's husband will love it. Truckloads of Love is such a great set for masculine cards. 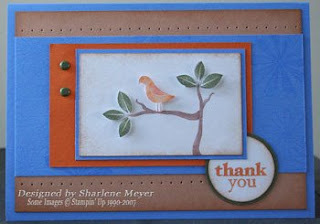 Check out more great cards on Sharlene's blog Magpie Creates. This is Sharon's gorgeous mini album. She has made a fantastic job on this using "Outlaw" dp and a selection of stamps and cardstock. You can check it out in more detail on her blog "Lemon Delicious"
I received an email from Anna this morning requesting that I add her to the blog. I'm so glad she did - this is one seriously talented lady! Check out Anna's blog, which lives up to its name Funky, Fresh and Fun. Lisa's one of our newest bloggers and despite her frustrations she's doing really well getting her blog going. To see what she's achieved checkout her blog Stampin' Up! with Lisa. It's great that she's started blogging, as you can see by her tag, her creations are beautiful, so I'm glad that she'll be sharing them with us. Here's another late night post. I was checking what you all have been up to while I've been at work. 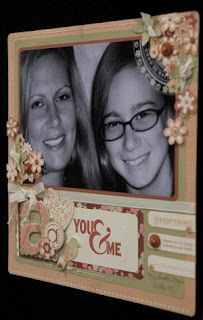 Rachael created this very cool shaker card for her daughter's birthday. I love the red and the DSP she's used. To see more details on her card check out her blog Impressions of a Late Knight Inker. Also you can check out her new layout. This is frustrating me so much!!!! Lisa has just started blogging and I've been helping to set up her blog this evening. Everything is working fine except for one thing. Her link above. It's not linking straight to her blog. If anyone knows how to fix it PLEASE let me know. I don't know what else to try. addit: Thanks for your comments - good to hear it's working for you. It must be my computer, because now its doing it to everyone's links. addit: 9/8 I think its a blogger issue, cause now the links have disappeared completely. I'll add another links list in the side bar, so everyone can still access blogs from here until blogger sort themselves out. Ok so it's not just a box.... surely it's got some amazing name to go with it, but I have no idea what it is. I'm sure it's not as complicated as it looks, but doesn't it look awesome. Megan after over a month between posting on her blog has been very busy, creating boxes cards and lots of layouts. Check out her blog The Stamp House to see what else she's been up to. A huge welcome to Chloe Danz, our newest demo in Wanganui. And man are we lucky to have such a talented lady join us demos. I have been following Chloe's "other" non SU blog for a while now and she has just started her new SU blog and you can check it out here. I am sure Chloe would be really stoked if you visited and left a comment to welcome her and show what a bunch of super people you all are. I am doubly stoked as Chloe loves challenges and I am sure that her entries in the ones on here will inspire you all to join in. I got a lovely surprise when I checked the letter box today (and despite all the rain it was still dry). I received this stunning card from Tracy, she's made a beautiful job of it using one of my favourite sets. 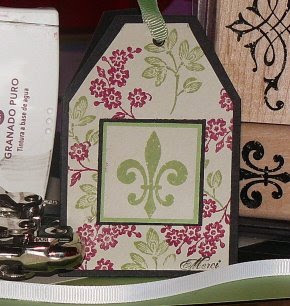 To see more of Tracy's creations check out her blog Stamping All Seasons. Thank you Tracy, it really did brighten my day!